On-point event promotion results in great attendance. 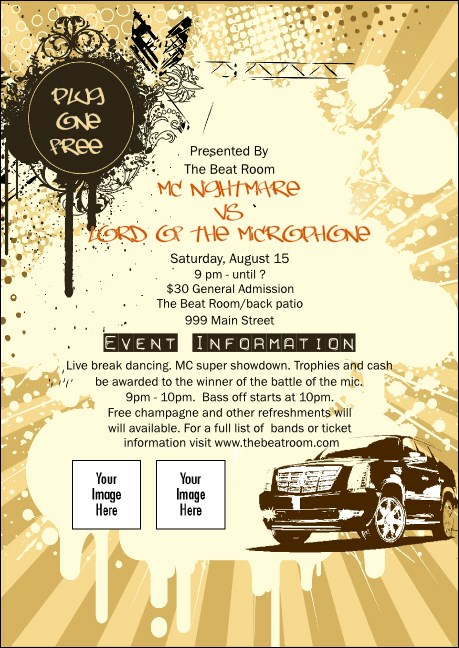 Use the Hip Hop Concert Postcard to promote your upcoming show! Its black, champagne, and cream color scheme and edgy black typeface draw the eye, ensuring your event won’t go unnoticed. Drop two sponsor logos or performer headshots into its image upload spots. Size is approx. 6.1" × 4.35"
Create buzz for your big event with custom printed postcards. Shop hundreds of templates on TicketPrinting.com.